At the same time as passing on a modest fee increase for distribution and retail newsagents, Fairfax has signalled a change to its remuneration process. This, in a letter sent to newsagents. I bolded the part of the letter that deals with the change. 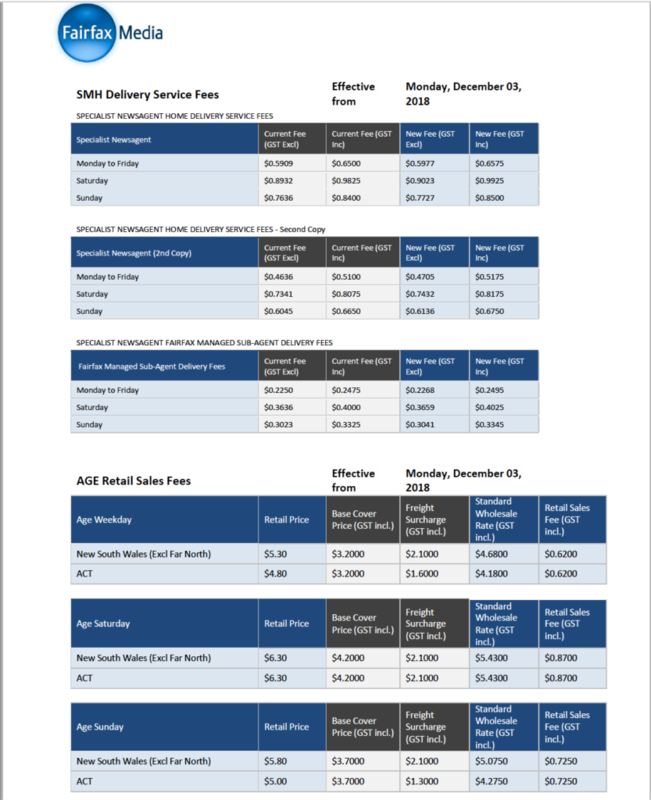 Fairfax Media has now completed a detailed review of the retail sales fees and delivery service fees currently paid to newsagents for The Sydney Morning Herald, The Sun-Herald and The Age newspapers. Fairfax considers that the current annual fee review process needs to change to reflect the changing newspaper sales and distribution landscape. It is our intention to move to a fee model and review process that is performance based. This model will provide for fee increases based on specific performance metrics, and will align with our newsagency contracts which contain provisions for fee penalties for non-compliance, or failure to meet existing performance criteria. Work on this is already underway. In the interim, Fairfax has decided to pass on an increase to its sales and service fees effective from Monday 3 December 2018. 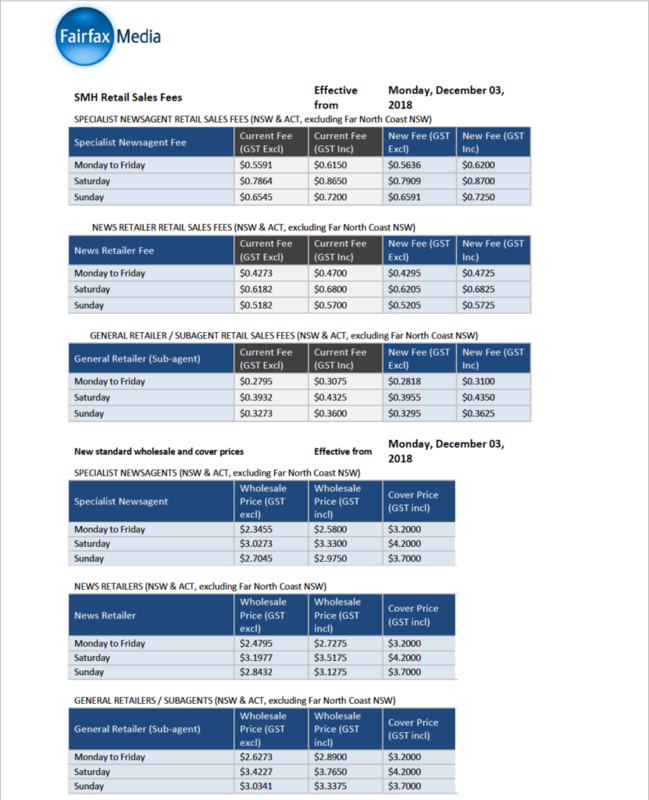 Details of each of the fee increases are shown in the Tables on the following pages of this notice. Further information can be found in the Fairfax Fee Schedule which will be available on Connect shortly. I think this letter signals plans for a shake out of newspaper distribution and retail businesses, given the focus on compliance and the goal of aligning with provisions in the Fairfax contract. What Fairfax management does not get is that what they pay is a pittance for a retail presence. Year on year, rent increases by 5%, wages by between 3% and 5% and overheads by 5%. Fairfax has not been keeping up and their forecast new approach will make matters worse I suspect. The result will be fewer retail newsagents selling their products.